Astronauts have run into their first big glitch with theInternational Space Station?s brand-new room, one that may delay plans for openingits long-awaited observation deck. An insulation cover for the $382 million module?s end capdoesn?t fit properly and is vital to protect the new Tranquilitymodule once the window-lined observation deck there is moved to its finalperch. ?When we remove a module and expose it to space, you wantsome kind of protection,? said space station flight director Bob Dempsey earlySaturday. The insulation is a round, multilayered fabric covering installedwith buckles and four fold-down bars to lock it in place. Astronauts could notswing those bars fully into place because pieces of metal securing handrailsand other tools in place in the dome-shaped window unit were in the way. The observation deck, a $27.2 million addition, is knownas the Cupola. It has six petal-like windows arranged around a round centralpane that is the largestspace window ever launched. It arrived with the Tranquility module aboard the spaceshuttle Endeavour. They were installed earlier this week in a spacewalkand opened late Friday night. Astronauts planned to move the observation deck next weekto an Earth-facing spot on the bottom of Tranquility, where it would give astronautsa panoramic view of the planet below. Dempsey said engineers are now considering whether tomove the observation deck without the insulation cover on the end ofTranquility or to leave it place for the remainder of Endeavour?smission and send a new fitted cover on the next shuttle flight, which willlaunch in mid-March. The end of Tranquility wouldn?t be exposed for long,Dempsey said. A cone-shaped adapter will be moved to cover it after theobservation deck is installed. There is also a concern that the same obstructionpreventing the insulation cover?s installation could interfere with the Cupola?smove to its final lookout perch. Engineers are studying that possibility too, Dempseysaid. ?When you have interference like this that you didn?texpect, there?s always that question in your mind that you have to go analyze,?he added. 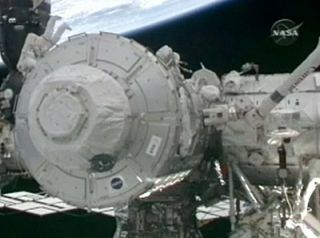 The Tranquility module and observation deck,called the Cupola, are NASA's last major additions for the space station. Theyare attached to the left side of the station's central Unity node. With them installed, the space station is now98 percent complete and weighs nearly 800,000 pounds (362,873 kg). The $100billion spacestation has been under construction since 1998 and is the result ofcooperation by 16 different countries. After opening the new room, astronauts swiftlygot to work loading it with gear. It was dark and sometimes stuffy ? the moduleis not fully activated yet ? but the astronauts managed to move a bulkyexercise machine inside and began outfitting the room for permanent use. ?It?s great to see it up here in space,?Endeavour astronaut Kathryn Hire said in a series of interviews televised onNASA TV. ?We?re filling it up very quickly.? While engineers on Earth study the Cupolaconcerns, Endeavour?s six-astronaut crew and the five spaceflyers on the spacestation are gearing up for their mission?s second spacewalk. Shuttle astronauts Robert Behnken andNicholas Patrick are due venture outside the space station late Saturday nightat 9:09 p.m. EST (0209 Sunday GMT) for a 6 1/2-hour spacewalk aimed primarilyat hooking up the plumbing hoses for the Tranquility module?s cooling system. The spacewalk is the second of threeexcursions needed to fully switch on the new space station room?s systems. SPACE.com is providing complete coverage ofEndeavour's STS-130 mission to the International Space Station with ManagingEditor Tariq Malik and Staff Writer Clara Moskowitz based in New York. Click here for live spacewalkcoverage and shuttle mission updates and a link to NASA TV.